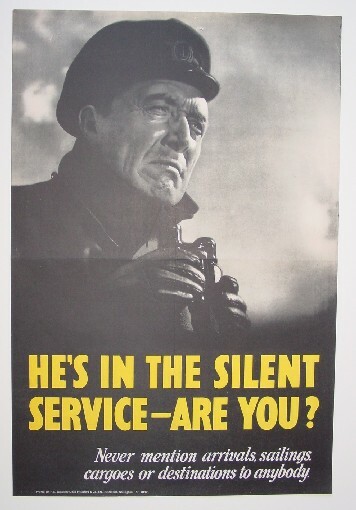 Title: He's In The Silent Service-Are You? Comments: This is a dramatic British poster picturing a serious ship captain with binoculars at the ready. It is on the "loose lips sink ships" theme that cautions: "Never mention arrivals, sailings, cargoes or destinations to anybody." It was printed for His Majesty's Stationery Office by Stafford & Co, Ltd., Netherfield, Nottingham. Pay securely with credit card through PayPal by clicking the button below.